Purge: Discard items no longer needed. Equalize: Consistently return items to their assigned homes every day. Kondo believes in making the decision easier on yourself by asking the question, “Does this spark joy?” She instructs her clients to take each item in their hands and note their body’s reaction. She asks, “Are you happy when you hold a piece of clothing that is not comfortable or does not fit? Are you happy to hold a book that does not touch your heart?” If the answer is no, the item should be discarded. In her experience she has found that most people can make decisions easily about clothing (Does it fit?) which will strengthen their decision-making skills for the following, sometimes more difficult, categories. By the time the client is ready to sort through mementos, he/she will have a stronger understanding of the tidying process and be much less stressed when making decisions. I found Kondo’s suggestions for discarding items helpful. She says to think of the lesson that the object taught you while you owned it. For example, the sweater you bought that was on sale but wasn’t quite your colour, taught you what was not your style. The sweater has served its purpose. It should be thanked for its service and be sent on its way to serve a purpose for someone else. If the item is to be disposed, it should be done in a way that honours the item. Organizing paperwork is difficult for many people so the KonMari method classifies papers into three categories: papers currently in use, papers that need to be kept for a limited period, and those that need to be kept indefinitely. She states that papers that do not fall into one of these categories can be disposed. Sentimental items that happen to be made of paper (e.g. wedding invitations, love letters) should be classified as mementos and organized within that category. Kondo provides recommendations as to which documents should be discarded. I would caution all readers to examine their personal situations and, if necessary, discuss with their legal and financial advisors prior to making decisions because laws and regulations between jurisdictions can vary greatly. While the general methodology of the KonMari method of “tidying” is very much the same as many North American books about organizing, I found the Japanese way of framing our relationships with our possessions quite interesting. 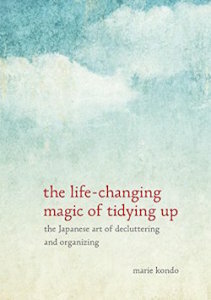 If you have had trouble parting with items you know you should really discard, The Life-Changing Magic of Tidying Up: The Japanese art of decluttering and organizing may provide a new perspective that will help get you started. I’ve read this book and it’s very worthwhile. The phrase “Does this spark joy?”, while on the surface may feel kind of corny, has been invaluable in helping me sort out things that I might have kept “just in case.” The other key piece is maintenance – her point is to do the big tidy-up once (rather than a monthly or semi-yearly declutter), then put your freshly minimized stuff back in its assigned place straightaway after using. I recently read this book after seeing it pop up in many places. So far I’ve gotten through the first category, clothing. At first I thought the idea of saying “thank you” to each item as you discard it was kind of silly, but I did it anyway and found it really helped me to let go of clothing I had been hanging on to. Especially items that had been gifts from beloved friends and family, but didn’t fit anymore or didn’t suit me. It was somehow soothing to say “thank you for conveying my sister’s love for me,” which I think is the true purpose of a gift. My husband read me some excerpts from this book, one of which suggested rolling t-shirts and standing them on end in their drawer. It seemed like a very nice solution to the problem of not being able to see what was in there, and it worked. At first. But I found that as soon as I’d removed a few, the others started to fall over, making a frustrating mess. I lasted maybe three weeks with this, and then went back to my old way of neat stacks in the drawer. It works for me. One thing that struck me about this book is the youthful perspective. A premise of hers is that anyone can sort through all of their things in one day, or at least in “one go.” Of course, many Japanese homes are probably smaller than many American homes, but her focus really does seem to be on the things in one’s room. She makes allowances for people who live with untidy other folks, but she’s speaking from the perspective of a person who lives with her parents, not with a spouse or significant other or kids. 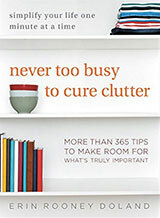 If the people you live with are cluttery, don’t get rid of their things, just focus on your own things in your own room. Uh…. Also, I don’t have a sprawling house by any means, but I have accumulated so many “homeowner” items (tools, lawn and garden gadgetry, etc.) that it would be a fool’s errand to try to sort through everything all at once. The book is useful and I love many of the things she has to say. Not just her insistence that buying more shelves and bins is the wrong move, but also her sweet-natured suggestions about respect and gratitude toward objects. I find myself in need of holding onto many of the items in my life that decidedly do not spark any joy at all (weedwhacker, bottle of dog shampoo), but if I’d read this book twenty years ago, I could have done it. And I still appreciate it as an aspirational thing. Also, yes, the t-shirt rolls fall over. 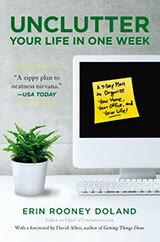 I am waiting to get this book at the library and can’t wait to read it! I thought the book is a lovely read, especially with the personal stories. I like the socks roll organization and the bags organization. I did find it funny about the shoe boxes storage, as I have also done the same. I have unclutter a lot of things, whether thru donations or discard, but I still keep a lot of other things, and not really knowing why I hang on to them. Now I look at every item differently, knowing which I should keep, because it spark joy, and which go to the donation/discard. Kondo’s approach really resonates with me. I have been struggling with what to do with things that I loved in the past but no longer feel attached to. By just getting rid of it, I have felt that it was dishonoring or cutting off some portion of my past. The idea that I have permission to, as corny as it sounds, thank an item before letting go provides me with a ritual to honor my past while still letting go of the physical. Although I am closer to 30 than 20, its taken me until this moment to truly feel at peace to release my beautiful Bitty Baby collection from when I was young. Thanks! I agree very much with Ruth’s review. I have a smallish house, but also thirty years’ worth of adult accumulation. If I were to put all of my similar items in a pile on the floor of a room, I would be totally overwhelmed and unable to go through them. I am going to try a version of this, by putting like items from some drawers on top of my bed, and going from there. Sorry Ms. Kondo, it’s the best I can do. I did like some of her techniques for enabling yourself to get rid of items, but I found the anthropomorphizing of inanimate objects a bit much. If I start greeting my clothes and thanking them, running my hands over them and giving them the respect they deserve, I’m afraid when it comes to ditching those objects, it will be even harder. Fine to greet your home when you return at night, but not so good to start making friends with the objects in your house. I got the book from the library and read it through. Some good ideas stuck. The bad ones I’ll discard. And I’m glad I didn’t buy this book. My T-shirt rolls don’t fall over because I cut the bottoms off cereal boxes and store the rolls in there, three or four to each of these shallow boxes. Concerning Ruth’s review, while Kondo does say to do your sorting in one go, she specifically mentions that that one go could be as long as six months. That’s important to remember. Putting all my stuff in a pile is what made this work for me. My pile of shirts/tops/sweaters was gigantic. It made me realize that I had way too many which made it so much easier to discard a bunch of them. Plus, once they are all on the floor you have no choice but to deal with them. And the Tshirt folding works is indeed magical. Mari does not say to roll the t-shirts. It is a fold. When done properly, it will stand on it’s own. And, she also says not to stack things like shirts on top of each other. You can do a search on YouTube and find others who have done it – and it is very, very efficient. And, yes, “one go” might mean 6 months. That was the longest time for one of her clients. That doesn’t mean it won’t be more for someone who has been a hoarder or had lots of inherited things for 50 years. For some people, that might be 6 months on one category. I find that touching and folding the clothes has a much deeper purpose than anthropomorphism. It gives you a chance to really look at your clothes and sense and see how they are doing. You notice stains, holes, weakness when turning thread-bare, missing buttons, loose buttons, and more. She says it is a conversation with your things – and I think that is true. They are telling you what they need and when it is time to go, too. I found that when I thought about it that way, talking to my things became very useful in both maintenance and letting go. Having never been a really tidy person, but not a hoarder either, I often wished I could have a more minimalist approach to my things. I read the book before Christmas, and found it gentle and kind, and probably full of more truths than I’d care to admit. I’ve only done my own room so far, which we now call the-bedroom-of-zen, and it’s stayed wonderfully tidy and clear ever since. There’s a place for everything, I’m aware of what I own and what I need, I find it easier to say goodbye to things I’m keeping unnecessarily or that no longer fit or make me feel good. It’s become a wonderful space to be in and I’m looking forward to the whole house being in the same state. Approach with an open mind if you can. Oh, and vertical stacking of t-shirts and clothes? Marvellous!